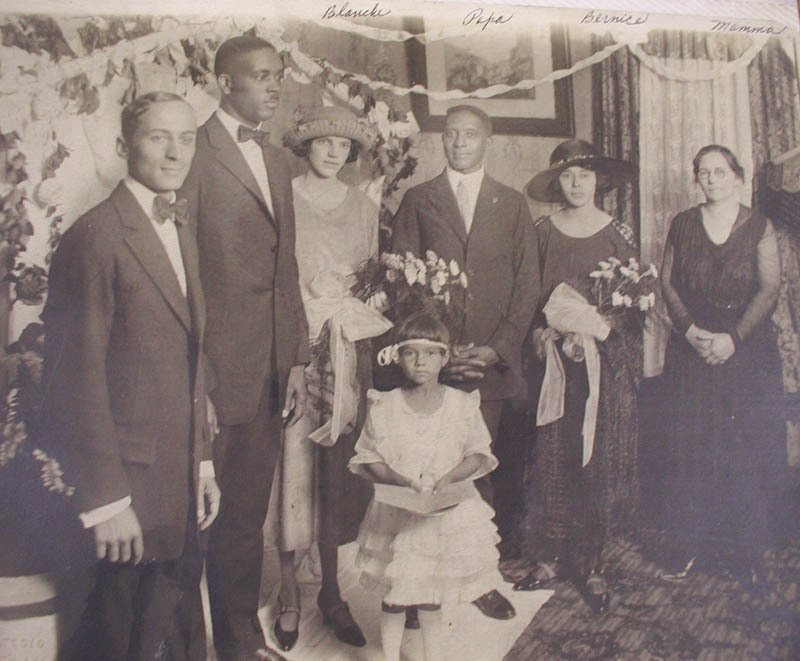 Mattie Saffold Harris with family. Sayde little girl, front. 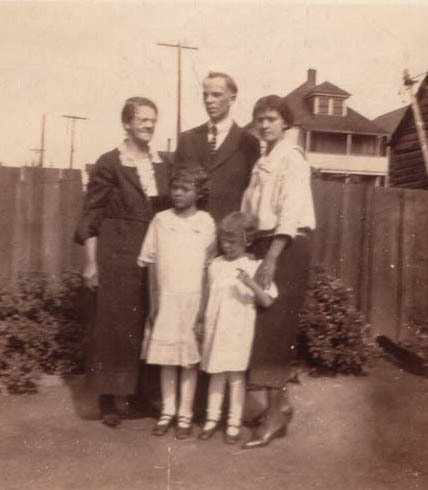 Her mother, Mattie, is on the far right. 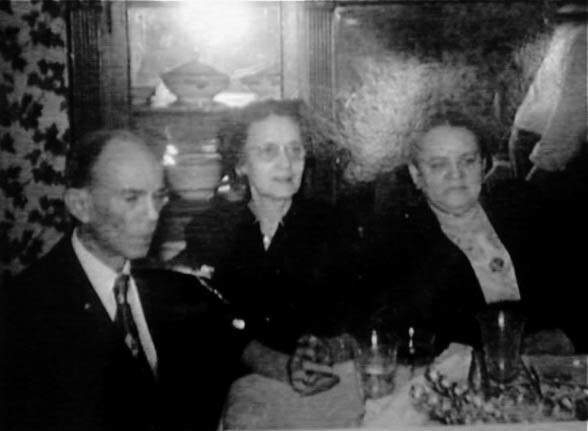 Mary Allen McCall on left. Granddaguthers Victoria and Margaret, front. This is an email conversation that took place between Janis M. and me. We shared a cousin, Margaret McCall. It was from information that Janis gave me from her mother that let me piece together the story of Eliza and her first daughter, Mary. It was so exciting to have the story unfold through her mother’s memories and the records I found online and things my mother had told me. Both Margaret and Janis’ mother Sayde have died. It was really one of those strange happenings where people are in the right place at the right time and can share the important information. Margaret and Sadye were related through the daughters Milton Saffold had with their grandmothers during and soon after slave times. You talked to my sister, Pearl, recently in Chicago at a book signing and gave her a chart. Have you ever been in touch with Margaret or Victoria? I can fill in the missing information for you from Mary McCall’s side. This past year I’ve been doing some research for Margaret about Milton Saffold. I found he married the daughter of Col. Edmund Harrison, who was the owner of Eliza Harrison who was Mary’s mother. 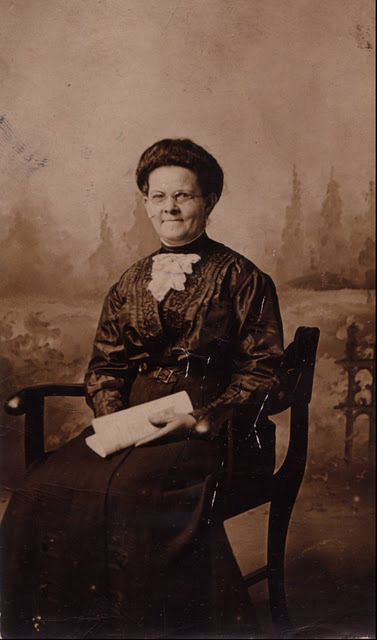 Eliza’s mother was also named Annie and I remember my great-great aunt Abbie, who was Mary McCall’s half sister, saying that Annie was African but I can’t find a record yet of anyone before the 1870 census. Margaret and I have been trying to find some records to place Eliza and Annie on the Harrison plantation. I was wondering, after seeing your chart, if maybe they, or Eliza went with Harrison’s daughter (Eliza was also his daughter) when she married Saffold. Do you have access to any records from slave times for the Saffolds? Eliza married Dock Allen and they raised 9 children. How do you know about Mary being a Saffold? Margaret said it was all very hush hush when she was growing up and it’s making it very hard to find information now. Let me know if you want more complete info for Mary and descendants. I’m so glad you saw Pearl! I will pass on any information you send me to Margaret. Right now I’m at my daughter’s in Seattle helping her with her newborn twins and most of my information is back in Michigan but I’ve got all the basic info on Dock Allen and Eliza. Looking forward to hearing from you. Wow, I will have to contact my cousin in Birmingham. 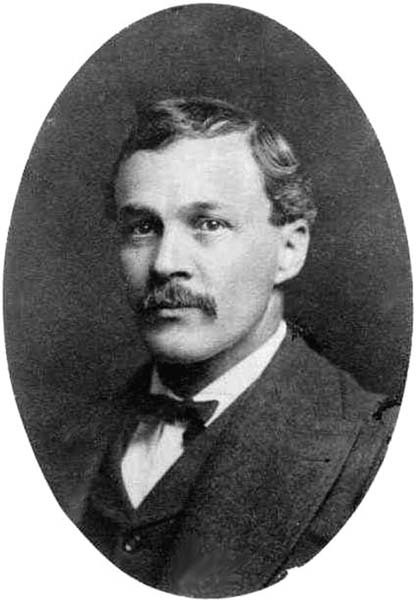 He is the family historian and if any information is forthcoming about the Saffolds it would be from him. I only know that Milton Saffold was my maternal grandmother’s father. Seems the judge “traveled” a lot! Will send my cousin your email and hopefully he can help us out. Milton Saffold. Mattie’s family photos. As it is late, I will have to take in all that you have written tomorrow. Forgot to tell you that I talked to Pearl at a reading in Bowie, Maryland. No, I haven’t talked to any other member of your family. My mother, Sadye Harris James told me that you have a relative who lives near me in a neighborhood called Kettering. She is the daughter of Hugo Howard. If this is accurate, I would like to contact her. My Mom got this information from Margaret Ward this past August. Until then I never knew that Milton Saffold had any children other than Mattie (my grandmother), and Frank. I look forward to you filling in the blanks in my chart. That would be great if your cousin can give me some more information. I’ll get the information I have together and email it later today. I’ll also check with another cousin of mine who grew up in Chicago and might know about the daughter of Hugo Howard and let you know. James and Margaret McCall visit his sister Tillie Howard in Chicago. I spoke with my mother, Sadye Harris James, the last surviving child of Mattie Saffold Harris. Mom told me that in l933 she visited her sister Blanche in Chicago. 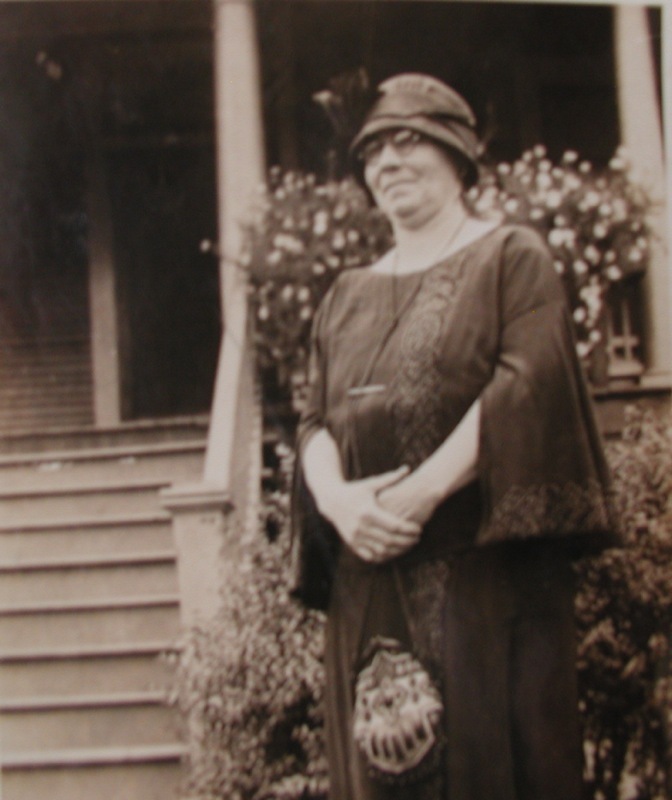 Blanche was living in an apartment building owned by Tillie and her husband Dr. Howard. Tillie and her husband lived in a unit of the building. Blanche told my mother that Tillie’s mother, Mary McCall, was visiting from Mississippi, and that she looked like their mother, Mattie. She was described as a little “white lady” dressed in a long white old-fashioned looking dress. (My mother only saw her from a distance). When Sadye returned home to Birmingham, she told her mother about Mary McCall. Mattie said she knew about a Mary McCall, and that she was her half sister. Mattie decided to visit Mary in Chicago and confirmed that indeed she was Mary Saffold McCall. This seems to be in conflict with your information. According to your records, Mary McCall was the child of Eliza Harrison and Dock Allen. Perhaps Milton Saffold fathered Mary and Dock Allen reared her as his own. By the way, Mattie was born in Selma, Alabama. Today I decided to look for Eliza in the 1860 census as a free person in Dallas county. I searched by her first name since I have looked in Montgomery and Lowndes county before with various last names. I found a 25 year old Eliza Williams with a 3 year old Mary Williams in Dallas county living with a 27 year old woman named Nancy Morgan and several of her children. All are listed as white. But Williams is the last name of Anne, Eliza’s mother and they are the right ages. It wouldn’t be the first time family members were listed in the census as white. Now I need to find out who Nancy Morgan is and connect her with the Saffolds or Harrisons. Another day. Nancy Morgan appears in the 1860, 1870 and 1880 census. She is listed as single in the first two but always has another child or two and in the last one she’s listed as widowed. She doesn’t have any occupation listed. Eliza Williams isn’t listed again as Eliza Williams but appears as Eliza Allen with her husband, Dock Allen. Her mother, Annie Williams lived with them in 1870 and with Mary McCall in 1880. Anyway, I’m going to bed. Just wanted to share that. 2005 – Janis taped an interview with her mother Sayde. In it she talked about her mother and Mary McCall being half sisters and their meeting in Chicago. I still haven’t found out who Nancy Morgan is. I did find a marriage certificate between a Nancy Wiggins and an Isom Morgan in Dallas County. William Wiggins was the overseer of Edmund Harrison in the 1850 census but I haven’t found any records connecting William with Nancy yet. When I attended cousin Victoria McCall Davenport’s 90th birthday celebration in Detroit she told me that her grandmother Mary told her she was about 10 at freedom. This fits in with the child Mary in the 1860 census. You have a beautiful collection of photographs. Treasure them. Thank you Linda. I do. I am a very visual person and I appreciate the photographs I have everyday.